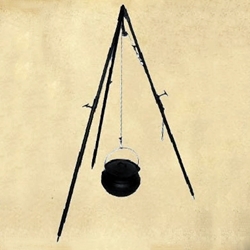 Medieval Cooking Tripods are heavy duty for holding small, medium or large cast iron cooking pots. These iron tripods are a perfect accessory for our Medieval Cooking pots designed for medieval period cooking. Legs are adjustable for uneven surfaces. Tripod Legs fold inward together for easy transport. Steel cables and pulley system raise and lower pots easily, no need for an iron kettle saw. Hand made - Specs will vary slightly from piece to piece.